The big teepee is just the beginning of your Pleasing Pedestrian Peasant Gastronomical experience. Our next Fun Family Friday features the opportunity to eat all around the town on the Progressive Dinner in St. Johns Friday, July 16. 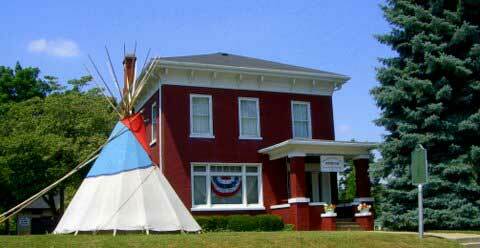 Start at the Paine-Gillam-Scott (PGS) Museum by looking for the big teepee (just west of the courthouse) where you need to buy your tickets between 5:30 and 6:30 pm. Your ticket will cost just $6.00 per person, and covers a choice of Flavorful soup or crispy salad from The Mint; your main dish choices of creamy macaroni and cheese or delicious pulled pork barbeque sandwich from Main Street Café, or yummy pizza slices from Main Street Pizza; and desert is your choice of ice cream from Cindy’s Ice Cream on Spring Street. All items will be packaged to go, so participants can enjoy their picnic dinners while sitting on the benches in town, or spreading out a blanket on the grass outside the Depot. If a blanket is not your style, feel free to bring your own chair or utilize the limited table and seating available at the depot. Short bottles of chilled water will be given out to participants at no cost at both the Museum and the Depot. There will also be an opportunity for you to buy your tickets downtown in advance at the Depot, the Art Gallery or Paine Gilliam Scott Museum . All proceeds beyond what is reimbursed to the restaurants will go toward the restoration of the historic railcars sitting outside the depot. After dinner, enjoy the displays at the Museum; stroll through town, stopping in stores or window-shopping; and be sure to check out the model trains and historic real train cars on display at the Depot. Starting at 7:00 pm, take your seat on the Depot lawn by the gazebo and enjoy the toe-tapping music of Scrambled Eggs. Although that may sound like breakfast, it is actually an Olde Tyme String Band that plays banjo, guitar, Dobro and ukulele to accompany their voices. They play mainly Appalachian, gospel, blue grass and folk music. For a real musical treat, be sure to join us- and join in. Fun Family Fridays are organized by the Clinton County Arts Council, which is supported in part by the Michigan Council for Arts and Cultural Affairs and the National Endowment for the Arts.